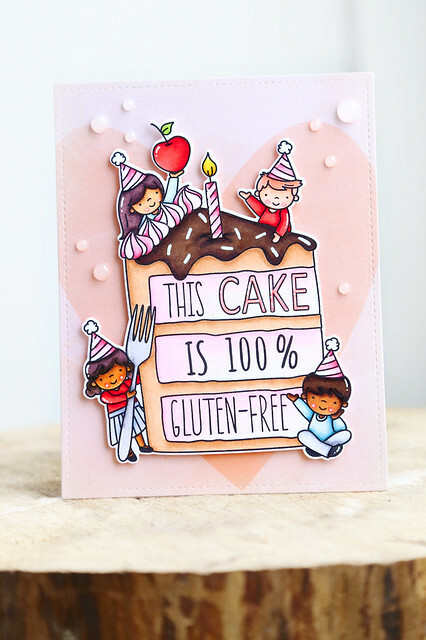 I used a few Ellen Hutson exclusive sets to create this card. The sweet girl is from Little Lady, and the sentiment is from Totally Random Sayings Vol. 2. I really love the mix of fonts in that set! My biggest challenge when I color people images is to decide on colors for the outfits. For this one, I gave her something straight out of my Maia's closet. It made me happy while I was coloring her. I hope you like it! Thanks for stopping by. Lawn Fawn is at the Creativation trade show right now with their new spring collection! For those of us still at home, we can see everything on their blog this week. If you're just tuning in, this is the last day of new product reveals. That sad whale needs a hug! 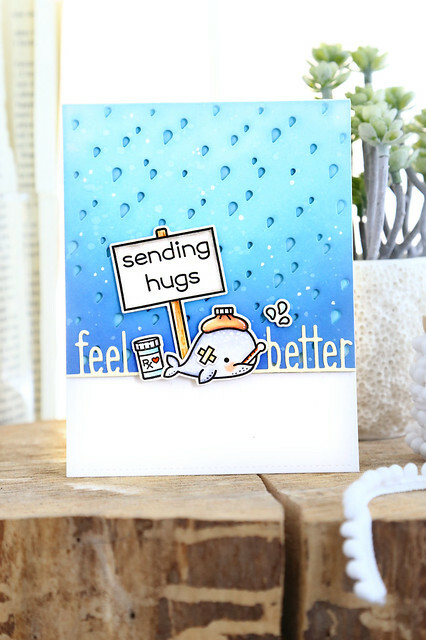 I did some ink blending for the background, and die-cut some upside down rain droplets. I dunno, to look like you're more underwater? 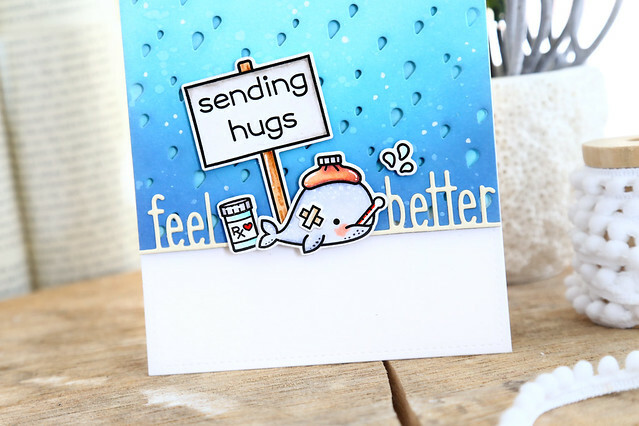 I colored the whale, his pill bottle and a sign-post, and cut the Feel Better Line Border to flank the focal images. I hope you like it! Be sure to check out the Lawn Fawn blog for more sneak peeks - click! Lawn Fawn has been showing off their spring line all week long, as they are taking everything to the big Creativation trade show in Phoenix! Everything you see on the blog this week will be for sale at the sale of February. 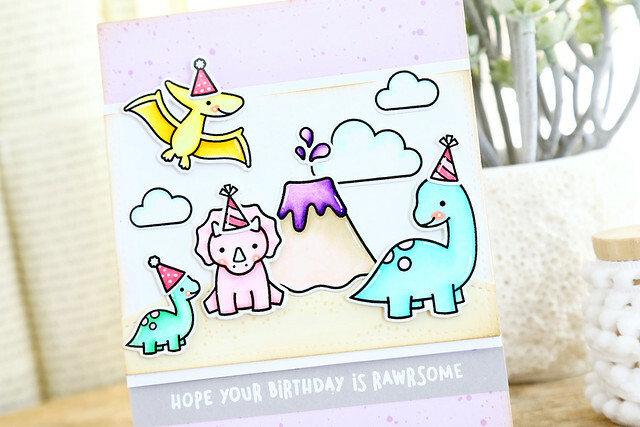 Today, I'm showing off the new dino set, Rawrsome! 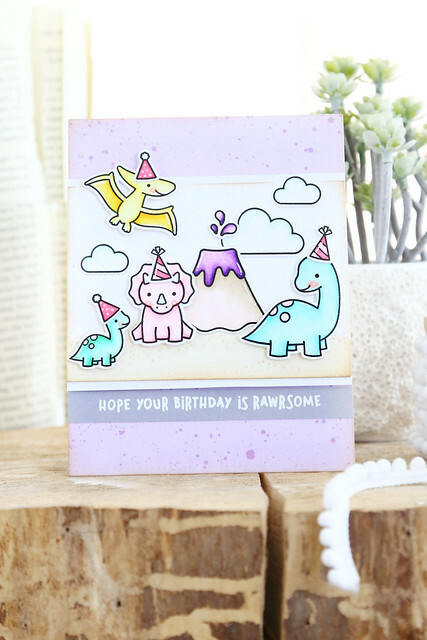 I did a girlier, more pastel dinosaur card (read: harder to photograph! gah!) because my niece will be celebrating a birthday in February. I with all of this pink and purple, I'm pretty sure she'll love it! 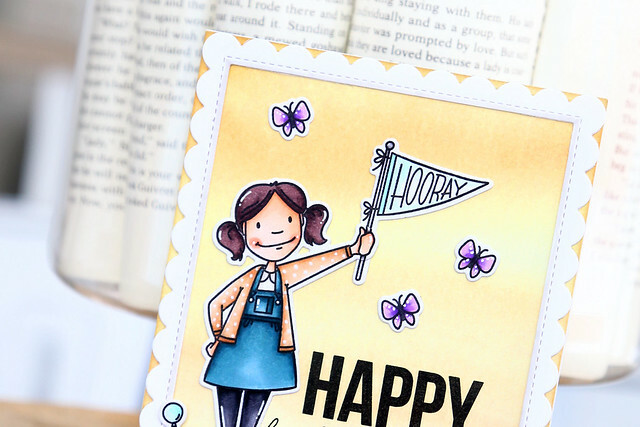 I used some *new* patterned paper for the background, from the Spiffy Speckles collection. 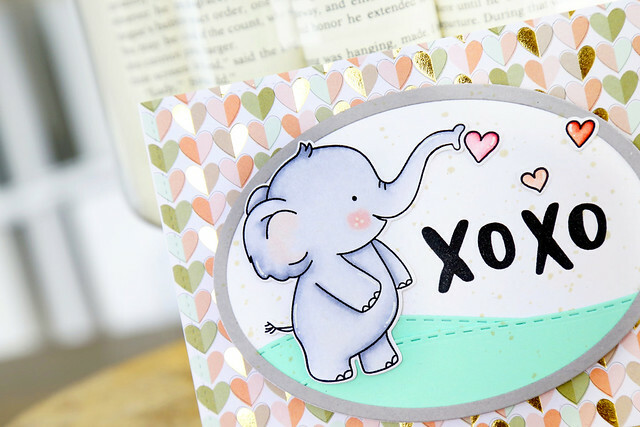 I am head over heels for this paper, especially the sheets that feature tone-on-tone splatters. I hope you like it! There is so much more to see on the Lawn Fawn blog this morning - click! 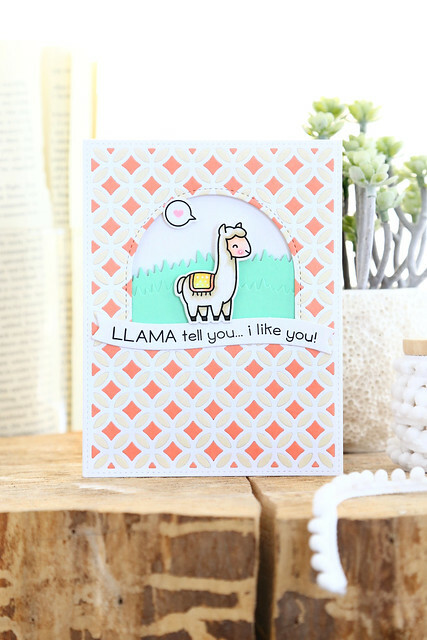 Lawn Fawn is showing off their spring line on the blog this week, before it all gets packed up to bring to the Creativation show! 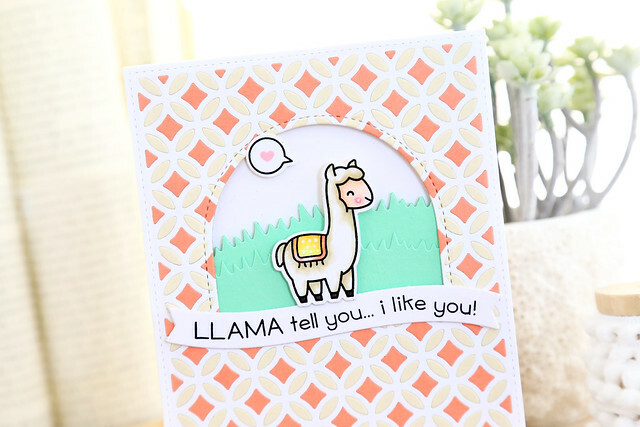 Today, I'm showing off a few new products: the Fancy Lattice Backdrop, and Llama Tell You. That llama is too cute! I hope you can that I did some work to inlay the background pieces. It looks so soft and pretty like this, and totally worth some extra effort. I started out by cutting the lattice backdrop 3 times - in white, cream and pink. Then, I punched out all of the pieces from the white backdrop and used that as my base. I glued that empty lattice backdrop to another sheet of white cardstock. To inlay the other colors, I avoided, as much as possible, removing the pieces from the die-cut Lattice Backdrops in the other colors. I simply dotted the glue row by row, and, placing the intact backdrop over the white one I punched out the desired pieces right over the little beads of glue. It didn't take as long as you would think! I worked a few rows at a time, dotting glue, and punching the pieces into place. 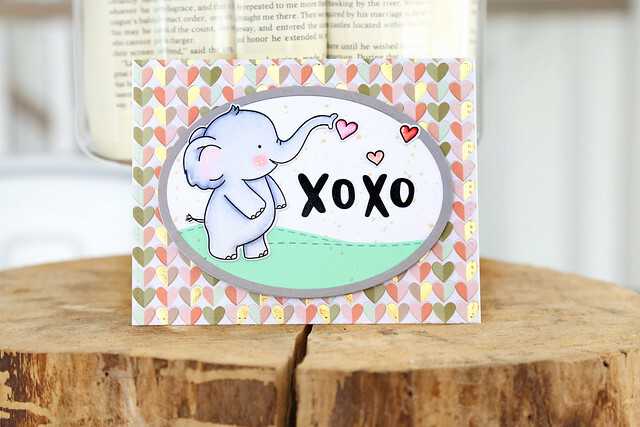 I hope you like it, and be sure to visit the Lawn Fawn blog this morning for more sneak peeks - click! 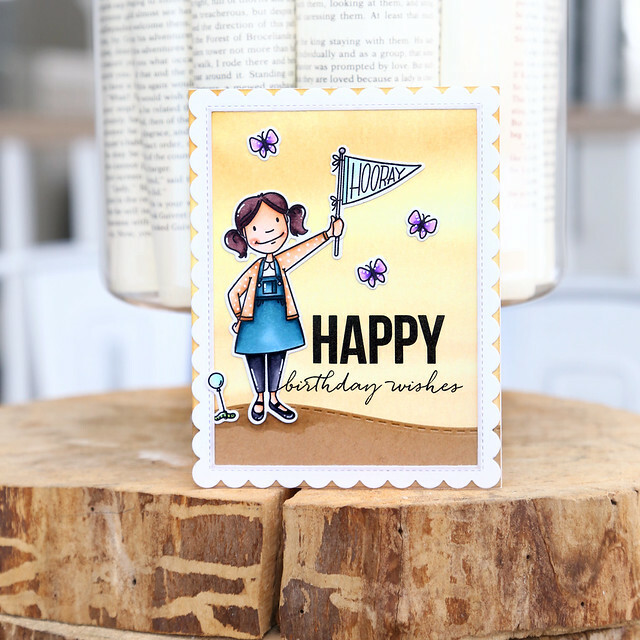 I'm here and on the Neat and Tangled blog this morning, with a little tutorial on how to stretch your stamps. 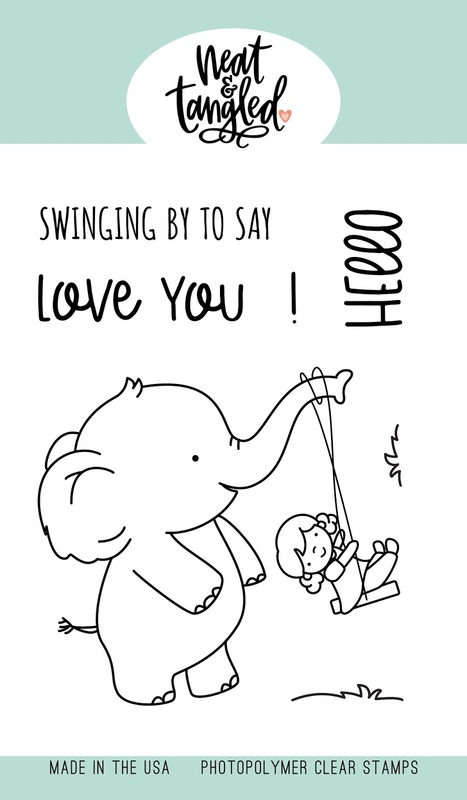 The newest release features this sweet elephant, but I want to show you how to remove the swinging girl so that the elephant can be used on his own. 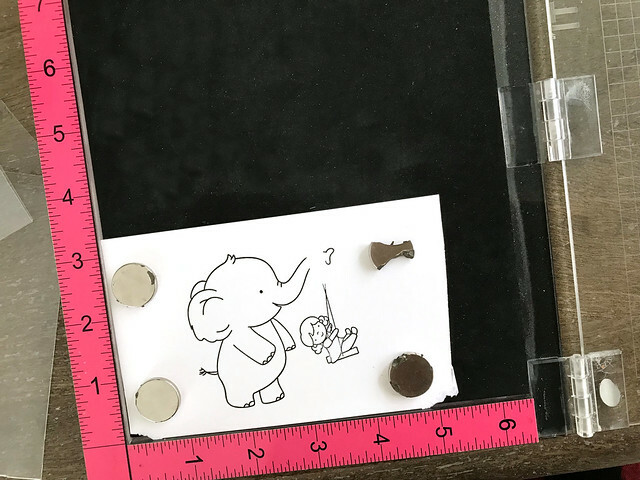 For the last step, you'll need to use a black pen (I used a copic multi-liner pen so that I could safely use copic markers to color the elephant afterwards) to draw in the missing lines. 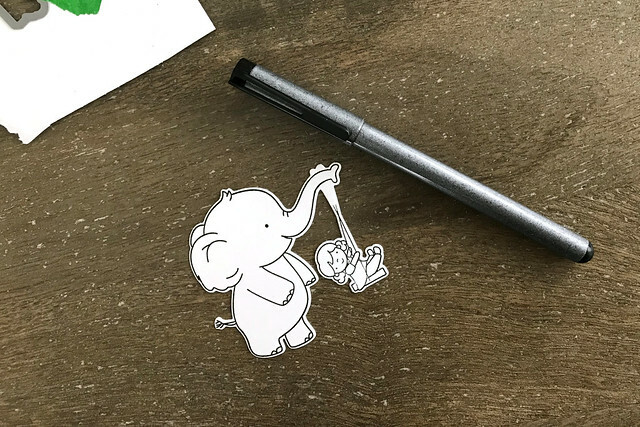 It's a simple way to be able to use your elephant in a new way! 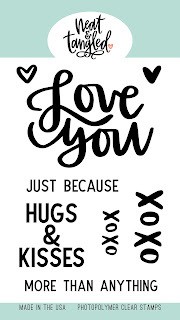 I have him blowing hearts for Valentine's Day, and the XOXO sentiment from Just Because sends extra hugs and kisses to the recipient. Lawn Fawn is showing off their entire spring line on the blog this week! Everything will be heading to Creativation, but they wanted to make sure you got to see it all too! The whole lot is only available for sale at the end of February. 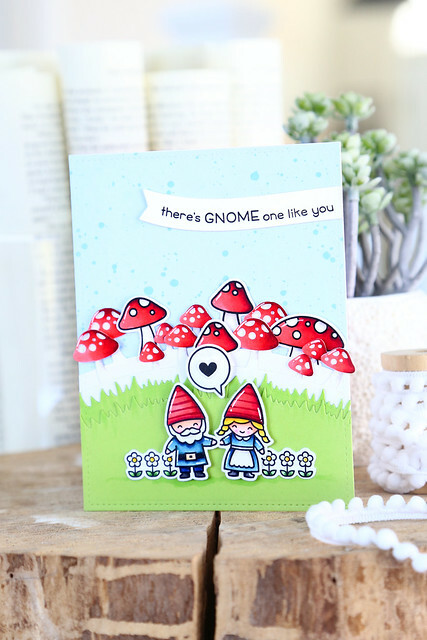 Today, I'm showing off one of the new sets, Oh Gnome! as well as the new Mushroom Border die. 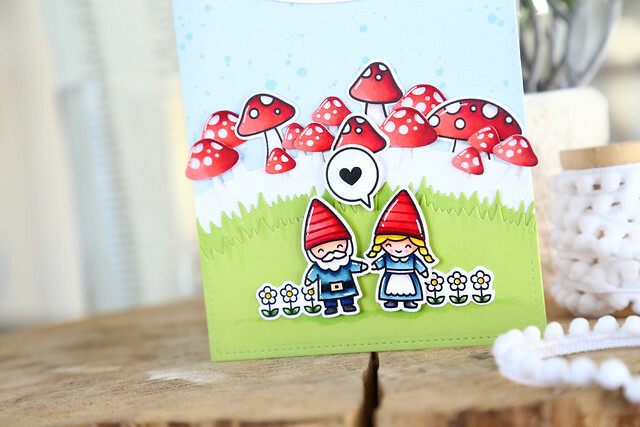 I colored the little gnome couple and set them in front of a field of wild mushrooms. I inserted stamped and colored mushrooms into the rows of die-cut ones. The patterned paper sky is new too! I just love this whole pad of paper. You'll see more on that on the Lawn Fawn blog tomorrow. I hope you like it! There's so much more to see on the Lawn Fawn blog this morning - click! We've come to the end of Neat and Tangled's January release week, which means all of the new products shown this week are available for sale in the store right now! This card features a big, mended mistake. I colored the entire image, and then stamped one of the greetings with a very shaky hand - ugh! But, what I love about art is, you can messed it all up and find a way to fix it, and no one would ever be the wiser. 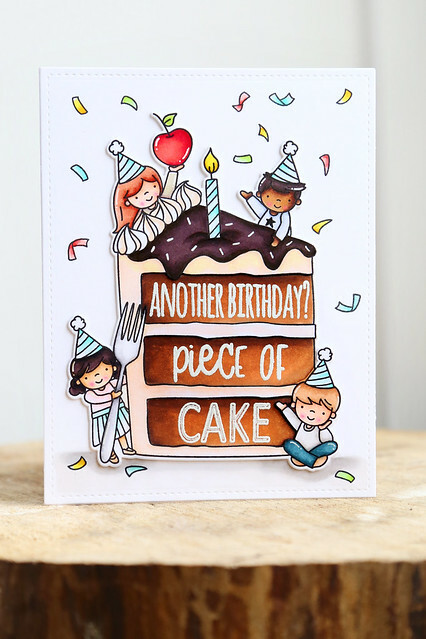 I used scissors to cut out the 3 cake layers, and then I re-stamped the greeting on a second image, that I stamped directly onto the base layer. I don't even think it looks like a mistake at all now, and even adds more texture to the card with the extra layer. To finish off, I added some stamped confetti all around the cake and did some shading at the bottom, to ground the image. I hope you like it! Happy shopping - click! Welcome back to the last day of new product reveals for Neat and Tangled's January release week! Everything will be available for sale as of 8am EST tomorrow morning. 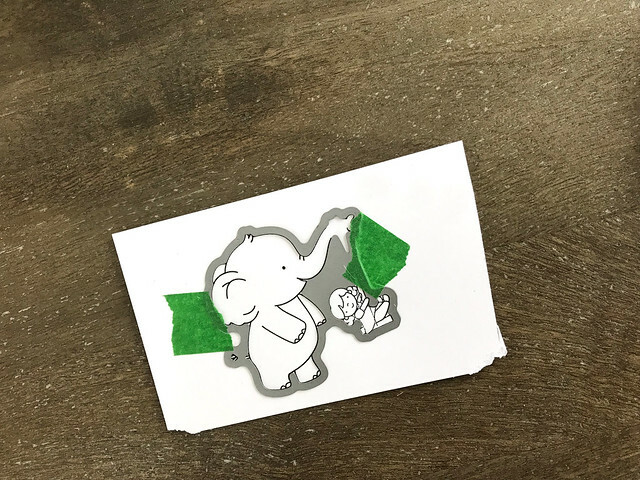 It features a single image, the elephant and the little girl swinging from his trunk, and a few mix and match sentiment options. I used some washi tape for an easy night-time backdrop - I can't stop using that stuff! 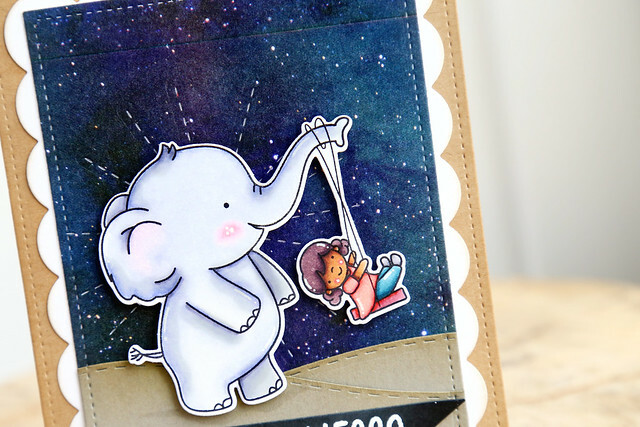 Before adhering the elephant, I cut into the night sky layer with the Stitched Sunburst die. 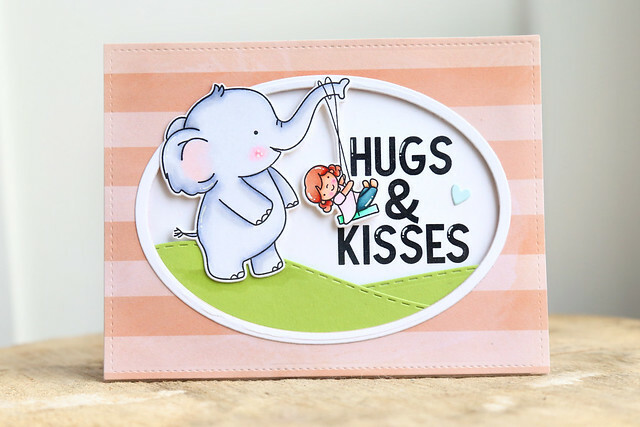 It's subtle, but I love how it draws further attention to the sweet elephant. I used the Stitched Slopes dies to create rolling hills beneath his feet, and heat-embossed the sentiment onto a black flag for a graphic touch. I hope you like it! There's more to see on the Neat and Tangled blog this morning - CLICK! And don't forget to leave me a comment before you go - Danielle will pick a winning comment from among the design team's blog posts this week. You could win a $25 gift card to the NT store. Welcome back to another day of this month's Neat and Tangled release week. 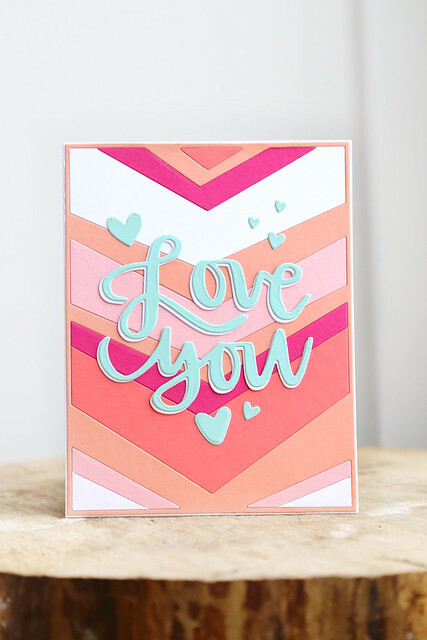 Today we're showing off the Wonky Chevron Cover Plate, designed by Miriam, and it is so fun to work with! 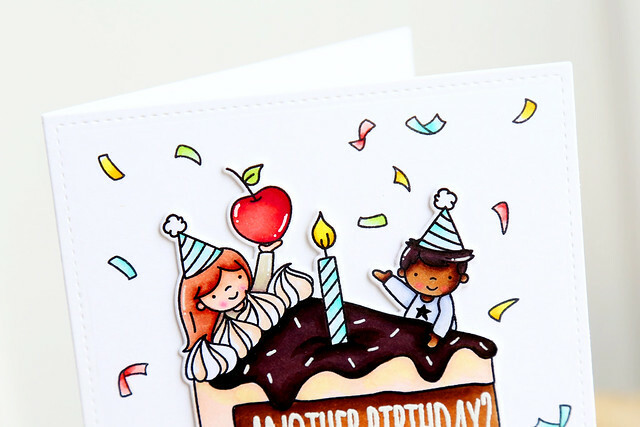 In a rainbow of different pinks and white cardstock, it is so fun! It has a kind of retro vibe, which I love. Then, I grabbed the Love You dies, and cut out the sentiment and the slew of hearts. 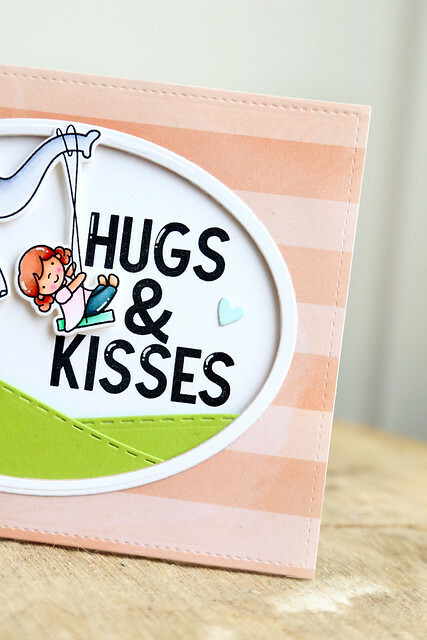 The sentiment was cut out twice, so that I could layer the mint cardstock with a white one, to create a shadow. It gives the sentiment more weight, and a heavier presence against the bubblegum pink backdrop. The tiniest hearts were cut out using the Little Bits die set. At only $5, that die set is one of my favorites. I hope you like it! Check out the NT blog for more design team creations - click! Welcome back to day 2 of Neat and Tangled's January release week! 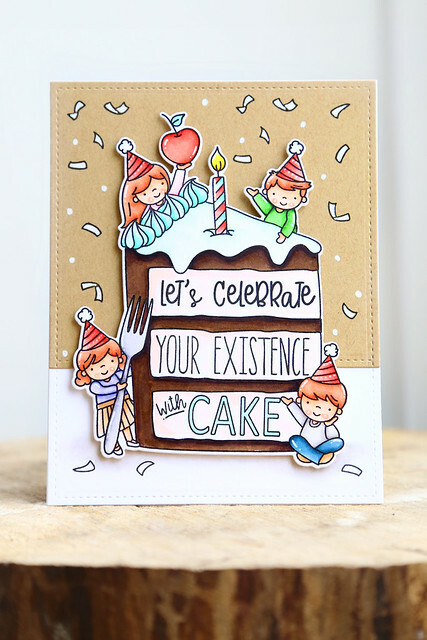 Today, we're showing off a 4x6 stamp set that I illustrated, called Piece of Cake, as well as a companion set, Piece of Cake Sentiments. 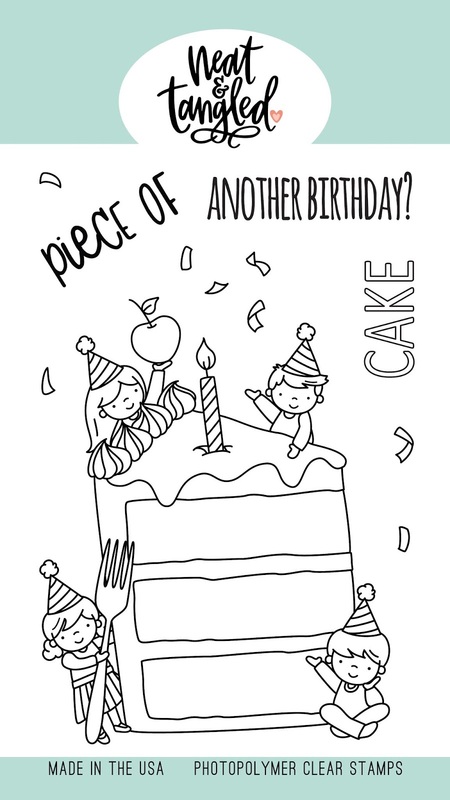 The cake image is really large, and as easy way to just stamp and get to coloring without having to create the scene yourself. I also designed it with my kids in mind! I could stamp a bunch and have them ready for Maia to color for her own friends' parties. 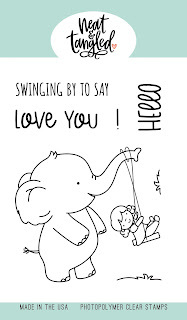 I have 2 cards to share with you today, so buckle in! Do you see how nice and big the image is? I love it. 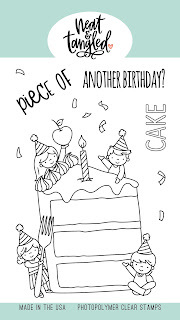 I stamped and die-cut the cake image and colored it all. I then cut a kraft layer that would fit about 2/3 of the card-front and stamped confetti to fill in the space around the cake. I also added some extra dots with a white gel pen. I also used the gel pen to color in the confetti on the kraft layer. The ones beneath their feet I left white. I love a card featuring a bunch of red-headed kids. Now, onto the next! 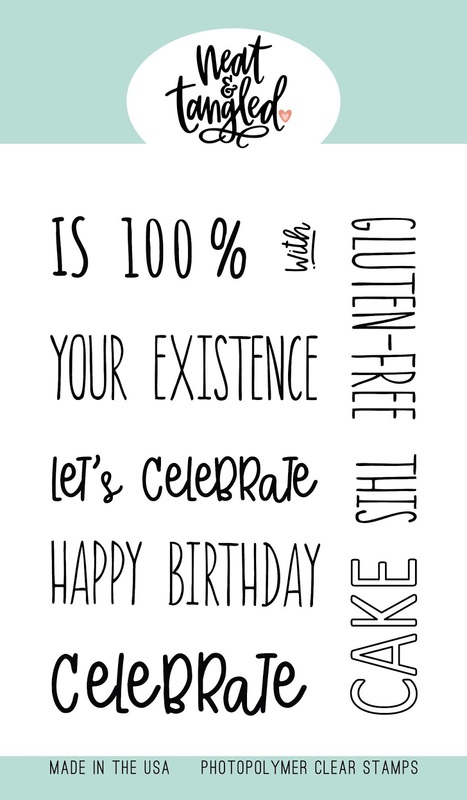 We all have that one person in our lives that eats gluten-free, right? 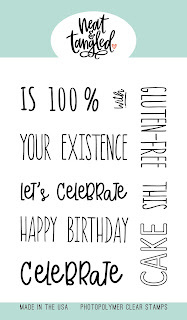 My sister can't eat any of the cakes I make now (although she makes yummy desserts that are dairy and gluten-free herself!) so I included a fun sentiment just for her. 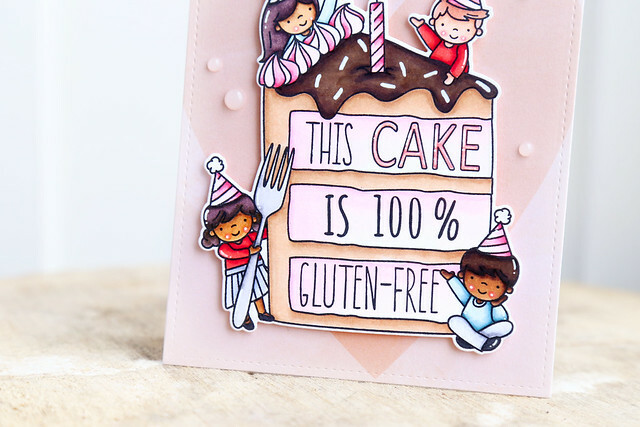 I love that the image can look so different, just based on how you color the cake and kids. I had fun with this one! 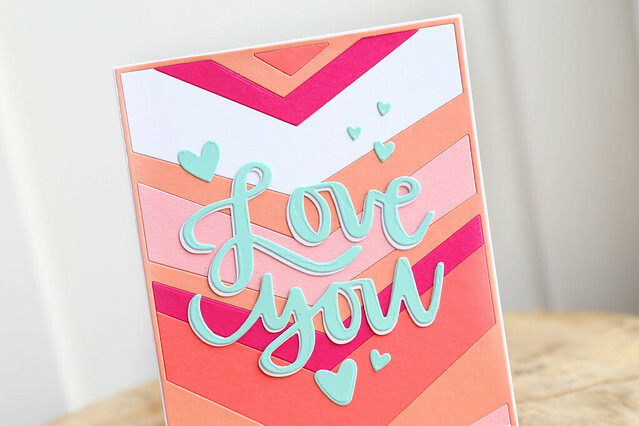 I found a piece of patterned paper that featured a tone-on-tone large pink heart and thought it would look super sweet as a base layer. I then added some dew-drop gems in lieu of the stamped confetti and called it a day. I hope you like the sets shown today! There is more to see on the NT blog this morning - click! And don't forget to drop a comment before you leave - you could win a $25 gift card to the Neat and Tangled store. Danielle will pick one winning comment from among all of the design team blogs this week. Good luck! Happy New Year! To kick things off here on the blog, it's time for Neat and Tangled's first release week of 2019. I am so excited to show off everything! 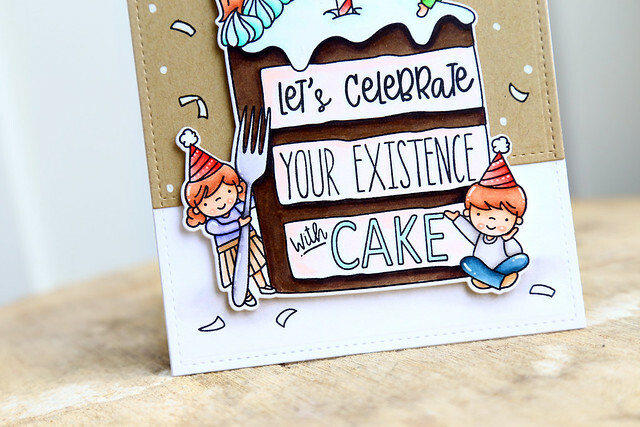 First up, a set featuring Danielle's gorgeous hand-lettering, called Just Because. 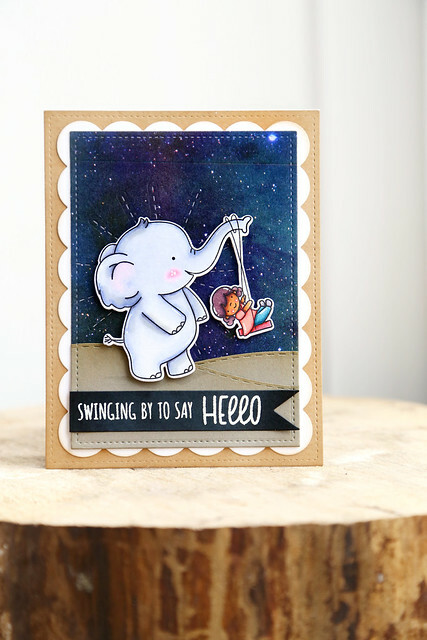 I stamped and colored the cutie elephant and his swinging friend, nestling her into the Hugs & Kisses sentiment. 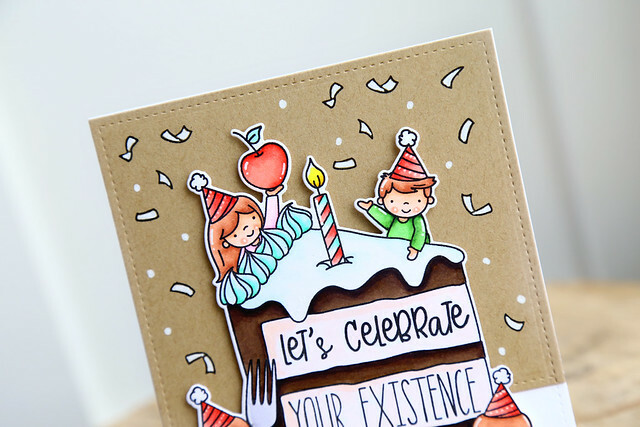 I love how that ties the image and the sentiment together, so that the entire card-front looks cohesive and purposeful. I used the Stitched Slopes dies to create some grounding beneath them, and framed out the focal images using the ovals from the Card Front Designs die set. Thanks for swinging by for Day 1! Leave me a message before you go - you could win a 25$ gift card to the Neat and Tangled store. Danielle will choose a winning comment from among all of the design team blog posts this week. 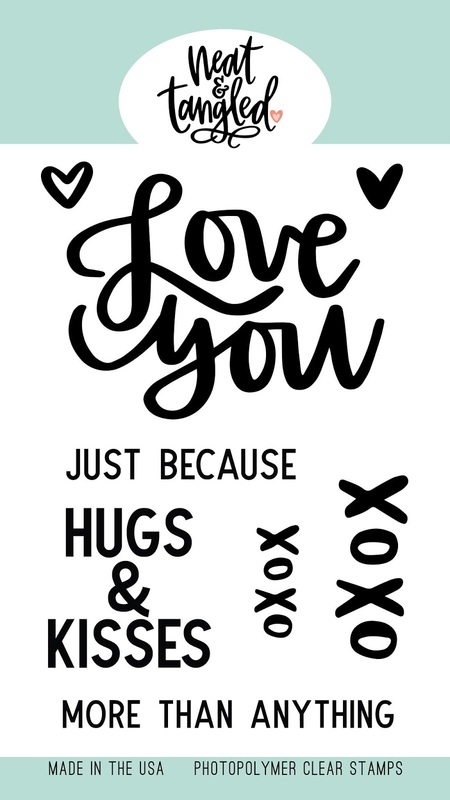 And be sure to see what the rest of the design team created for you today - I will say that my cutesy design kind of sticks out like a sore thumb, haha. You'll see what I mean - click!